Tim Hortons is going where the growth is: east to China. The Canadian institution announced it will expand its portfolio of 4,700 restaurants by signing a joint venture partnership with a Chinese-based equity firm. Tim Hortons currently has locations in the United States, the Arab Emirates, the Philippines, and the United Kingdom, and it intends to open 1,500 new restaurants within the next decade. By 2028, almost a quarter of Tim Hortons restaurants will be in China. Cartesian Capital, the equity firm partnering with Tim Hortons, has worked with its parent company, Restaurant Brands International (RBI), in an expansion of the Burger King franchise into China more than a decade ago. Burger King now has over 1,000 restaurants in China alone. This is not their first excursion. Over the years, the Chinese-Canadian community has embraced Timmy’s menu, which is a result of their familiarity with its place in the country’s culture. In China, the majority of the population may only vaguely understand the appeal of hockey, never mind the allure of timbits and salted caramel ice capps. Burger King has been successful thanks to the directness of its name. It will be interesting to see what kind of brand and menu adjustments RBI will make as they work to adapt the namesake of a top NHL defenceman to the Chinese market, without betraying Timmy’s deep Canadian roots. Starbucks has already infiltrated the Chinese market, boasting more than 2,800 locations. Thanks to the Starbucks ‘effect’, the demand for coffee in China is up more than 15%. In Canada, growth is minimal, even though more than 71% of Canadians over the age of eighteen drink café daily, compared to 67% who regularly drink water. Unlike Canada, coffee is much trendier in China as the country prospers from rapid urbanization, a growing middle class, and rising incomes. What was considered as the Republic’s favourite drink, tea, is slowly giving way to its roasty rival. While Coffee is increasingly consumed outside the home, tea remains a traditional, domestic favourite. Tim Hortons’ legacy in Canada lies in convincing Canadians to make and consume coffee somewhere else than their home. However, in these past few years an increasing number of Caucasian Canadians are preparing coffee themselves; the trend for Asian Canadians is the opposite. For marketers, this shift represents the golden goose. RBI understands that once a certain level of wealth is achieved, and disposable income increases, coffee-related behaviours will change. To grow the chain in China, RBI must accept that the benchmark for success is Starbucks. After fifty years of business and community building, Tim Hortons’ became the benchmark in Canada. The advantage Tim Hortons’ has over Starbucks in China is its middle-of-the-road approach to coffee; to convince someone who traditionally drinks simple tea to switch to a decadent Frappuccino presents a significant challenge. Tim Hortons’ can slip in-between current Chinese habits and the representation of an idealistic western way of life. Its menu will need be tweaked, of course; potatoes wedges and steak wraps will likely not be crowd pleasers, at least initially. 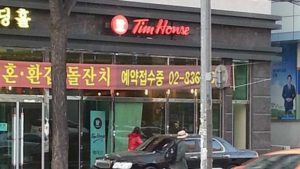 Tim Hortons’ move to China is clearly a natural growth of a chain searching for a new identity in new territories. With deep roots in Canada, and an American flair to its management, Tim Hortons could emerge as a global coffee player in the next decade. Its status as a cultural icon in the Canadian market was well established before RBI’s purchase of the chain in 2014. While Canada is mainly known for its homegrown commodities such as canola and maple syrup, Tim Hortons’ entrée into China could potentially bring Canadian culture into an entirely new and bourgeoning market. Its success can reap dividends for many other sectors as well, especially in China. It also gives international exposure to our cultural values, beliefs, and way of life; something Canada is known for, but never intentionally exported. One thing is for sure: Timmy’s may well have to imagine promotions other than the “Roll up the Rim to Win” campaign. Mandarin or Cantonese-speaking customers may find it difficult to incorporate such a tongue twisting slogan into their lexicon, but perhaps the taste of a double-double might ease the transition.